The Evil DM: This is how I roll! : The Evil GM - Minis or Tokens? When we game we always tend to have some type of visual on the gaming table, because not everyone is able to picture the scene in their mind. This mostly applies when it comes to combat, we all like to see where we are, compared to the baddies and figure out how we can plan our attack on them. Some people enjoy minis (painting or buying pre-painted) saying it enhances the game and helps them visual their characters actually fighting. Others say tokens are just as much fun, doesn't cost as much, and you really only need something to show where you are in the combat. I personally fall under both, and sometimes don't really care to use them at all. Minis are nice to have, but I feel they do cost quite a bit, while tokens are cheap and you can print them off your printer or go to staples and have a whole bunch printed up for the cost of 5 minis. Both do the same job, represent your character's position in the combat, so for me either or will work. 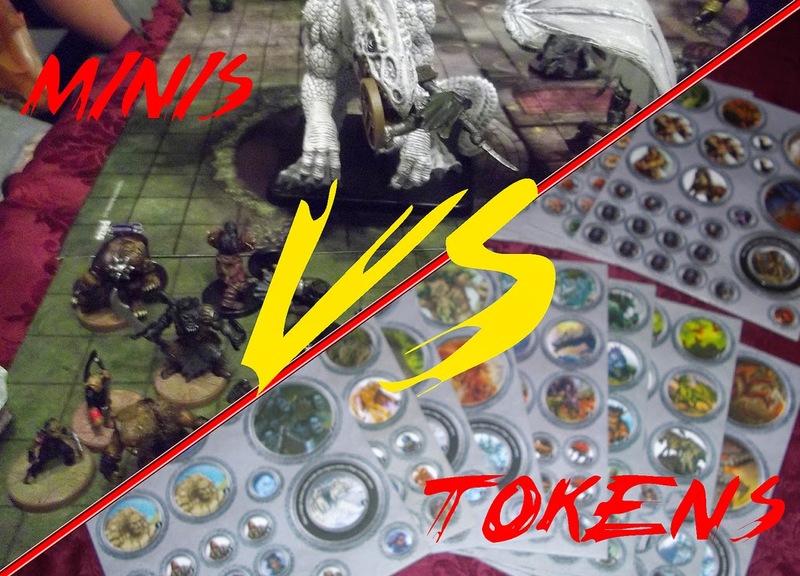 What do you use, and is it important to have minis or tokens at all? Personally, I like use metal minis when I can, but sometimes that's not practical. Either there are not enough minis for what you need or you are using kobolds for evil badger ninja since there are no metal minis for that. While I have used dice as tokens before, I tend to use some form of paper minis. There is such a large variety out there, you can print as many as you need, and you can recycle them when they are done. Not to mention if you do keep them and loose some, you can just print more. In the end as GM, I use paper for NPC and Monsters mostly, and the players tend to use the metal minis.